This past Friday we saw a brave British challenge come to a crushing end, as Anthony Crolla was brutally KO’d by pound-for-pound best (in the opinion of most) Vasyl Lomachenko, and this Saturday night we will see Amir Khan, arguably the gutsiest lower-weight fighter hailing from the UK today, go up against another P-4-P star in Terence Crawford. No-one was willing to predict a Crolla win over Lomachenko, and, perhaps worryingly for former 140 pound champ Khan, a poll of experts compiled by RingTV.com has failed to produce a single pundit/trainer/fighter willing to pick a Khan win over the defending WBO welterweight king. 23 experts were asked their opinion – people like Ricky Hatton, Ronnie Shields, Barry Jones, Abel Sanchez, Jeff Horn and Paulie Malignaggi – and all picked Crawford to win and win big. The majority of these experts are picking Crawford to win by KO; most of them by late-rounds stoppage, though some are predicting Khan will last all 12-rounds only to lose a wide decision. It would certainly be a massive upset if Khan managed to pull it off, very possibly the upset of the year. But don’t tell Khan he can’t do it. Supremely confident, Khan says he has “seen things” in Crawford’s style and approach that convinces him he can beat him. “I know I can win,” Khan, 33-4(20) has said. Just what flaws or weaknesses Khan has seen in Crawford, 34-0(25) is something of a mystery. Thus far in his excellent career, “Bud” has shown zero flaws or mistakes, certainly no obvious weaknesses. Fast, deadly accurate, capable of taking a good shot (on the rare occasion one has got through Crawford’s superb defence), always in top shape and a better puncher than some may think, Crawford has shown he is the complete package. Indeed, if you don’t list Lomachenko at the top of your personal P-4-P list, chances are you favour Crawford. 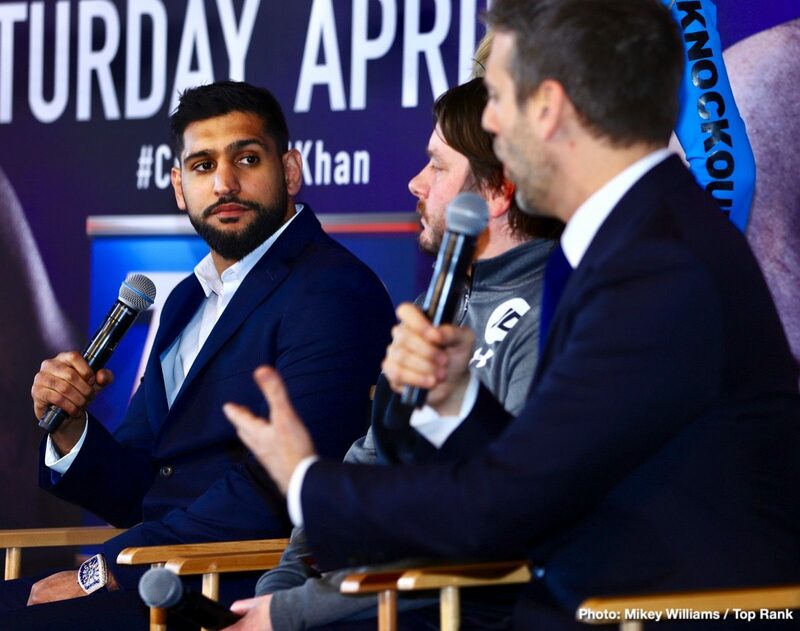 It will be a competitive fight, in the early rounds especially, this due in large part to Khan’s blazing hands, but by the half-way stage it will be Crawford’s show. Khan’s leaky defence combined with his seriously suspect chin will prove to be his downfall. A spiteful puncher who takes his time in dissecting a foe, Crawford may well administer a nasty beating on Saturday night. It could prove to be Khan’s last fight. Crawford by TKO in the ninth-round.